In this third book of a wonderful series, Author M.E. Lorde creates a gripping story set in the Earth’s future, where the youth of the world have the privilege and burden of saving humanity from extinction. 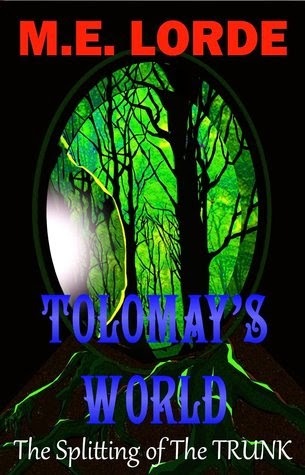 Tolomay Ramey trained her entire life to do one thing... to travel to the future ‘clean world’ of Earth and keep safe all citizens who will begin humanity anew. A brilliant and giving soul, Tolomay was alone for three years, before others finally arrived, her days surrounded by little more than nature. Things have changed. After falling in love with Kenter, the stubborn first male to swim through the Pool of Light, she has endured horrific trials with her newly discovered ‘family’. While Eric, a male she met along the way, vy’s for her affections, the dreaded Sandra has eyes only for Kenter. What will happen when Tolomay is forced to make a disturbing choice regarding her and all others living in the new community? There is a greater threat to all, when those from The Mountain of Tegi refuse new citizens ‘Peace of Life’. Will ‘She’ make the right choice for the entire community? Can she survive her decisions? Find out, in this third novel of a seven book series. ‎The last book in the series told us about how Tolomay was kidnapped and taken to her Father's underground kingdom. We learnt that Tolomay has an actual family who she never knew about and slowly she wins her brothers' hearts over. Her father is pure evil and he has fed his people with lies about the overground world, so as to keep his people confined underground and therefore under his control and rule. There are levels of class, with the dark haired people living at the lowest levels in the worst conditions. Tolomay also learns that Tarron the man she always believed was her father is alive and kept prisoner in the mountain. Tolomay manages to escape in the last book and we see how that escape goes in this new chapter. After a lot of struggle Tolomay manages to leave the mountain with many of her people, her dear brothers, David's secret child and Tarron's child. Unfortunately her father does not survive but urges her to find the scroll and read it alone, again, in order to direct her on the upcoming war. Tolomay fights for her life when she is bitten by a poisonous insect and in her delirious state mutters her love to Kenter, who tends to her throughout the entirety of her unconsciousness. Once she is well she reads the scroll and has to make the most difficult decision ever. She must choose a match, but the one she chooses will die. Tolomay knows Eric and Kenter both love her but she cannot bring herself to match Kenter, knowing he will die as a result and so chooses Eric. The war approaches and we finally see Eric's true colours, and that his death is his own doing. I can't wait to know what happens next and how the war goes. Are the goldhoarders really as bad as they are believed to be or can Tolomay win them over too? “We all make choices, some more difficult than others. Still, we can choose them each, one at a time. Even difficult choices must be made, my wonderful child of spirit and light.